Israelian-Polish joint issue. 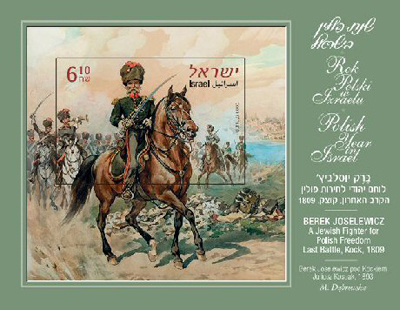 The sheet and stamp show Berek Joselewicz sitting on a horse, wearing a captain's uniform, and heading a regiment during the battle of Kock. Painting made in 1893 by the Polish painter Juliusz Kossak. Author Marzanna Dąbrowska. Inscriptions on the frame: 'Polish Year in Israel / BEREK JOSELEWICZ a Jewish fighter for Polish freedom. Last battle Kock 1809' (also in Polish and Hebrew).